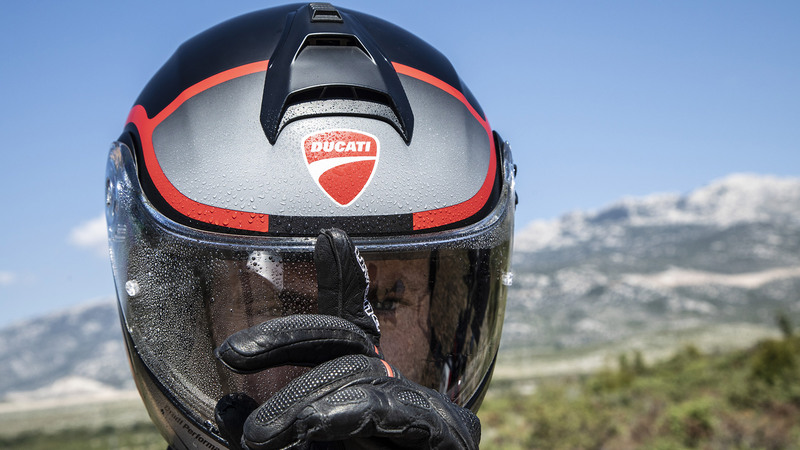 The helmet is the most protective element of a motorcyclist’s equipment. 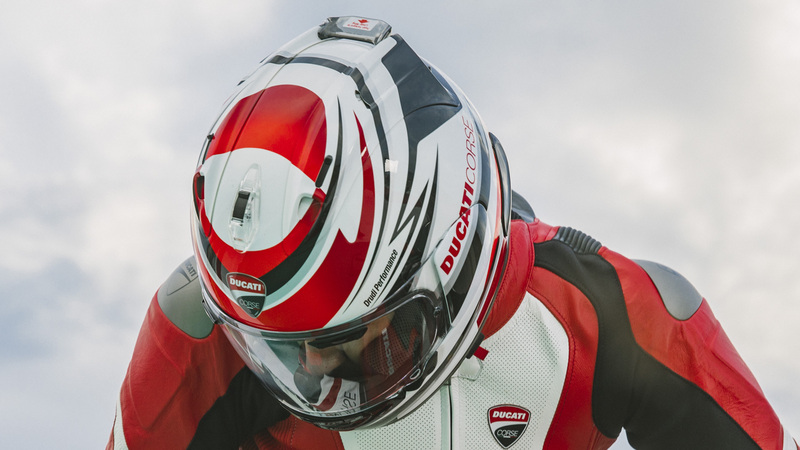 Ducati offers you a vast range of helmets, all strictly fibre and featuring advanced technical solutions designed to ensure maximum safety and comfort. Is your helmet more than 5 years old? It’s best you replace it. Helmets are constructed so that the energy from an impact is absorbed via the partial destruction of the shell and/or lining; damage is not always visible to the naked eye. 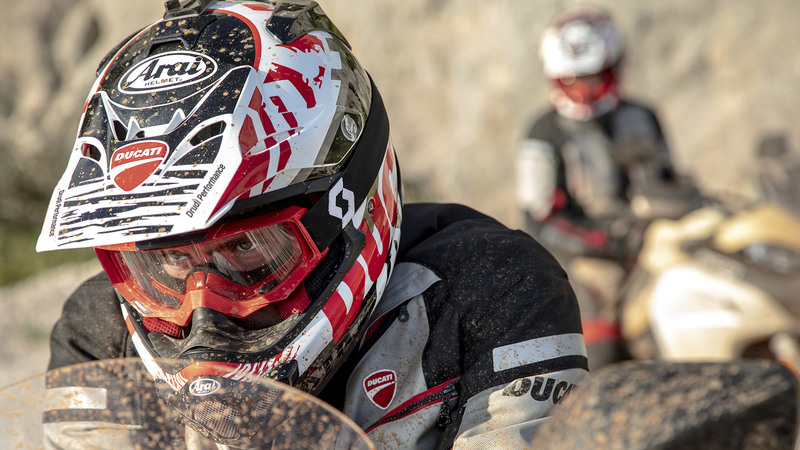 If in doubt as to a helmet’s protective capacity, have it thoroughly checked or replace it. 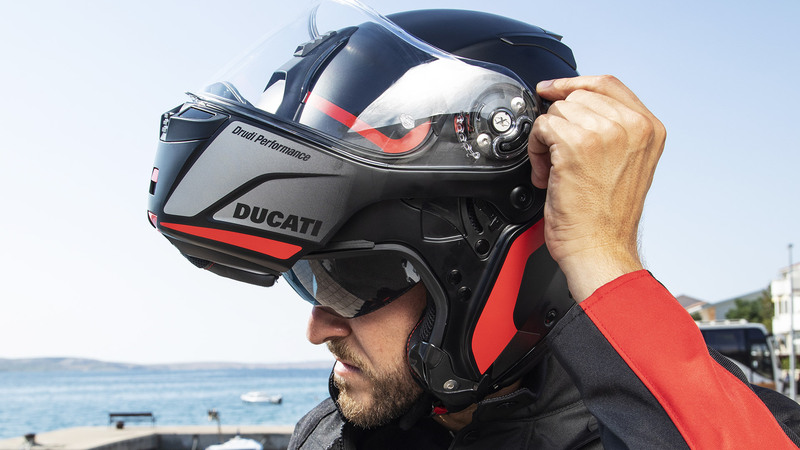 If it has been more than five years since the helmet was first used, we suggest you replace it anyway, even if it still functions properly and does not display any obvious defects. 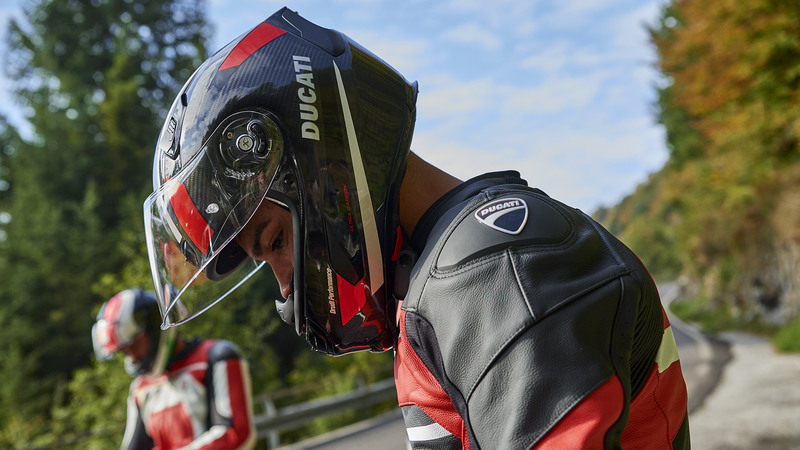 The racing helmets are designed for a tucked-in, forward-leaning riding position. 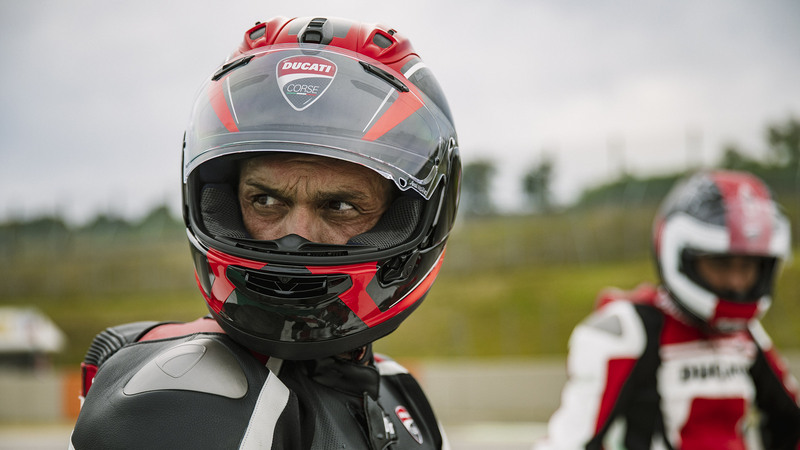 They are aerodynamically stable at high speeds, offering a close fit and a very wide visual field, particularly when the rider is tucked-in along the straight. The centre of gravity is conceived so as to stress the neck as little as possible, while the ventilation system optimises the flow of incoming and outgoing air. 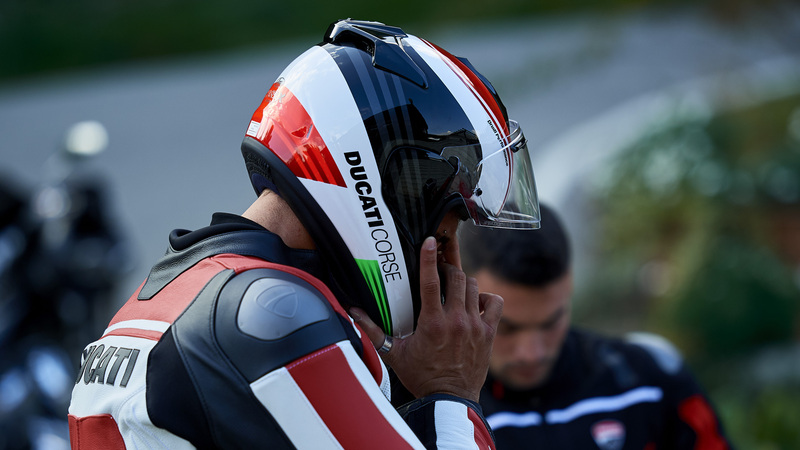 Ducati Corse Carbon 2 It is made of aviation carbon fiber hardened and decorated by hand by skilled craftsmen. Ducati Corse V3 Matte finishing and sketch of the new V4 engine for the new helmet top of the range. 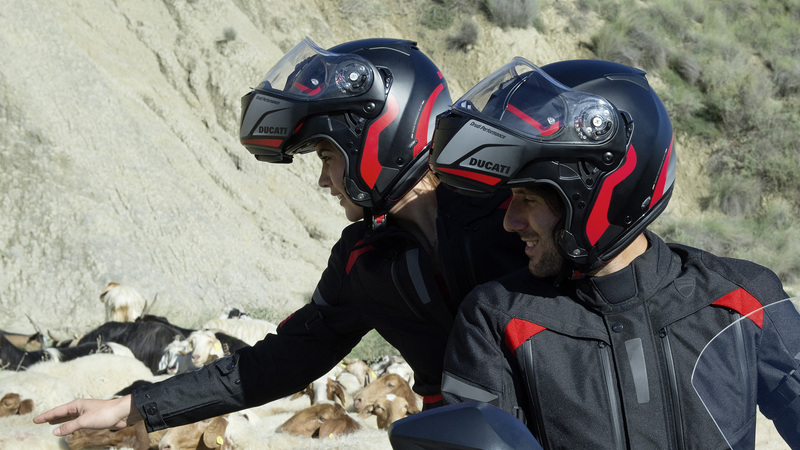 The helmets for sports riding on the road are designed for both performance and long-range travel. 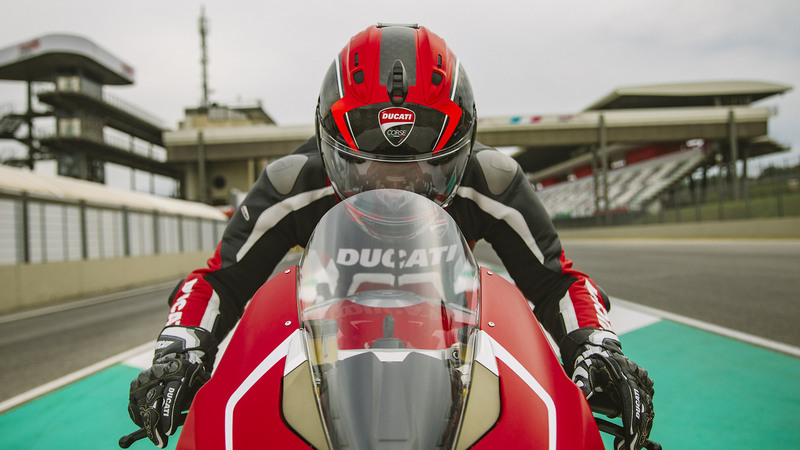 Riders assume a tucked-in and forward-leaning riding position, despite speeds and posture being less extreme than on track. The fit is comfortable, ventilation effective and adjustable, and the finishes conceived specifically so as to reduce noise. 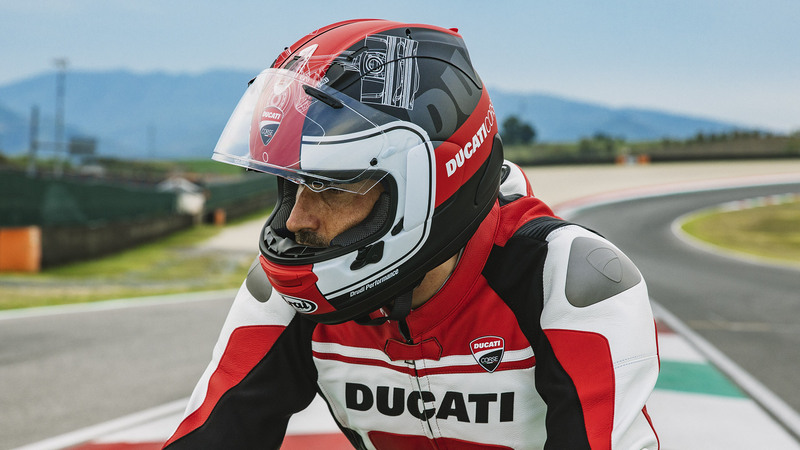 Speed Evo It is the full-face racing helmet with high level of carbon content dedicated to Ducatista who loves sport riding. 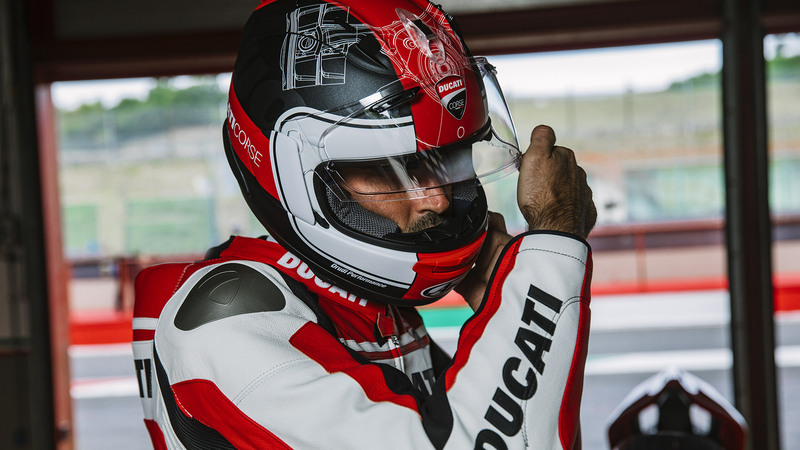 Ducati Corse SBK 3 (red) It is made of super fiber shell with a completely renewed ventilation system and increased viewing angle. 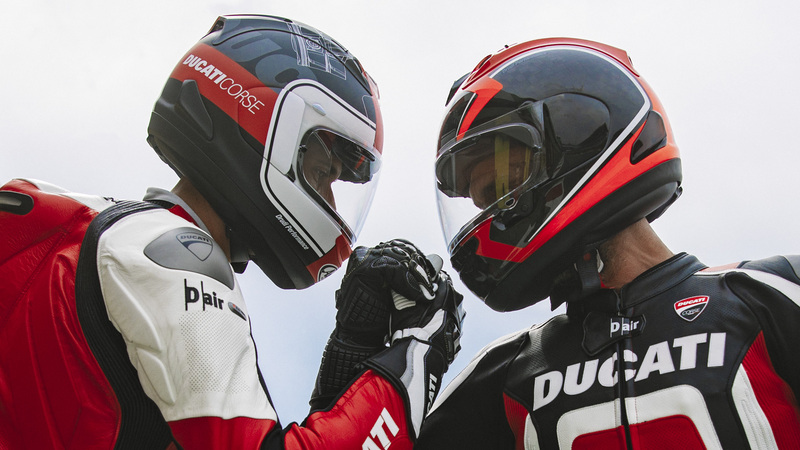 Ducati Corse SBK 3 (black) Design black and white with a matte finish and the same features of the red one. 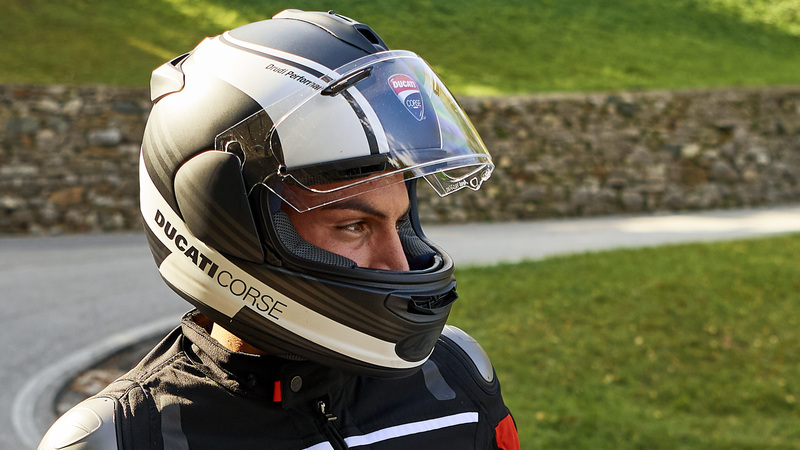 The helmets for urban use are comfortable, quick to put on and well-ventilated, perfect for daily trips and the summer period. 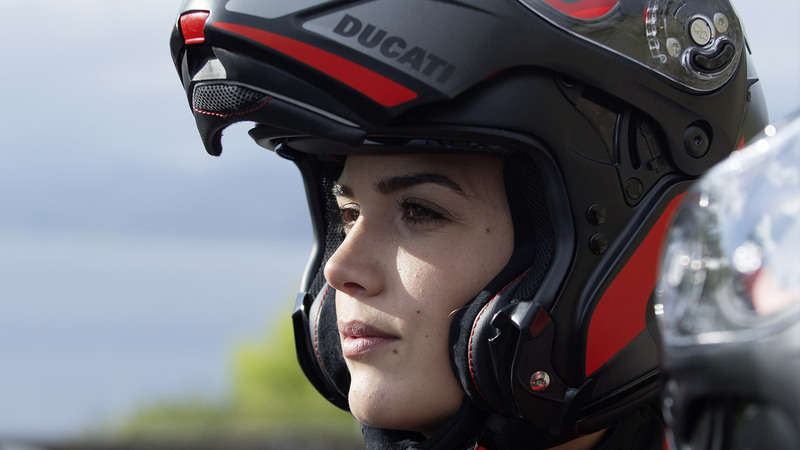 In the typical urban riding position, the rider’s chest is at 90°, while arms and legs are relaxed; these helmets therefore allow you to muffle the excessive incoming air, making the ride as smooth as possible. Black Steel Based on new model with a sophisticated design, it's developed for use on naked bikes. 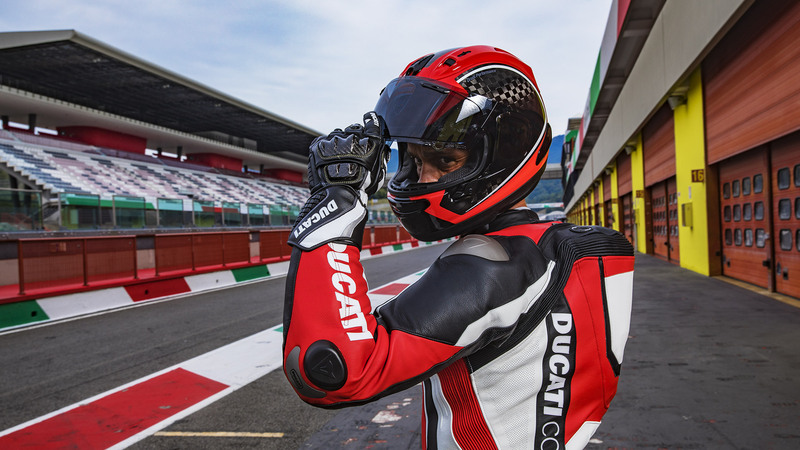 Redline The sophisticated and elegant design matches perfectly with all items in the Ducati urban collection. 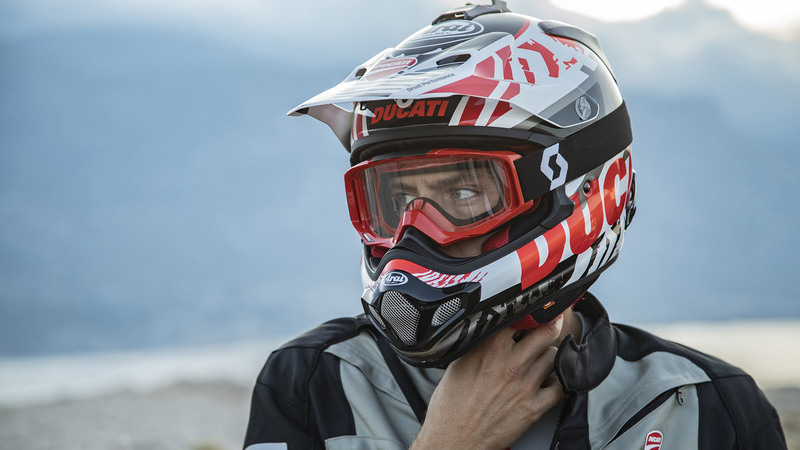 Ducati Recon Based on shell made with Super Complex Laminate construction, it combines a new internal ventilation system with Vas sport visor. Dark Rider V2 Minimalist design, extremely comfortable and pratical thanks to the internal sun visor. 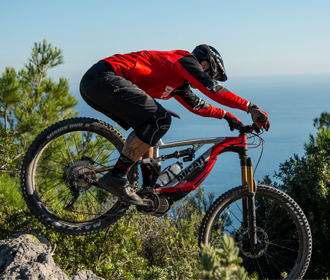 Peak V3 The design is distinguished by sleek lines, the shell is made of fiberglass and carbon fiber to provide strenght and lightness. 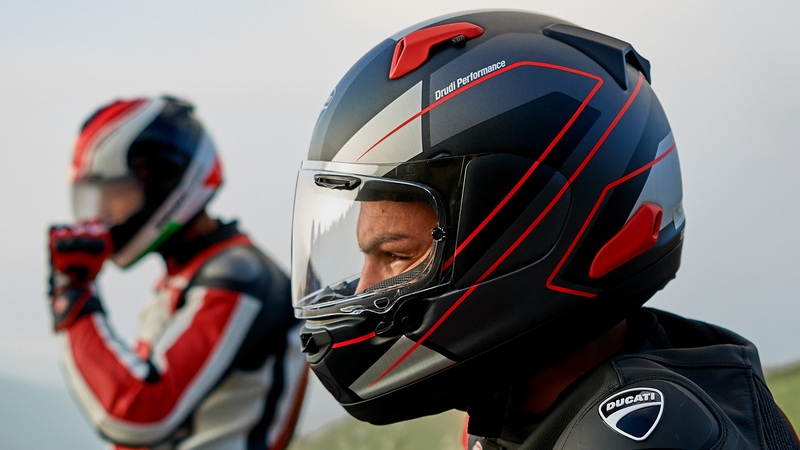 The touring helmets, both full-face and modular, are designed to be used in an erect riding position and ensure versatility across various road surfaces. 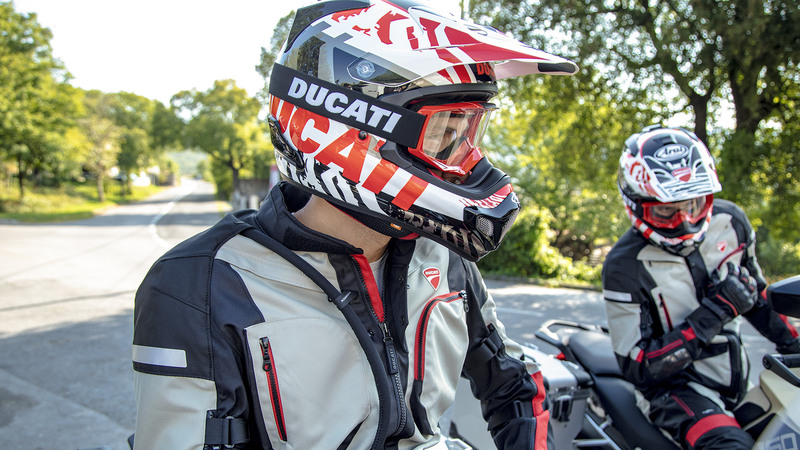 Comfortable and noiseless, the helmets feature ventilation systems that are specifically constructed to offer maximum comfort, particularly on long-range trips. Explorer V2 A wild nature and typical adventure design. 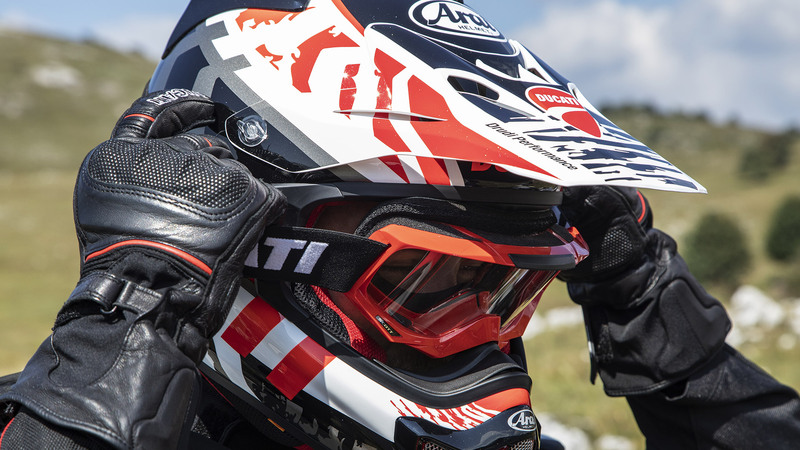 The helmet is perfect for enduro and off-road use. 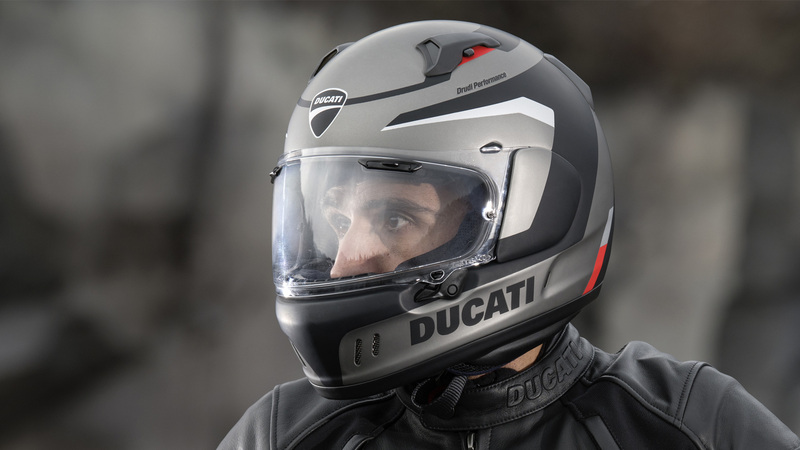 Ducati Horizon The Horizon helmet is an openable helmet in composite fiber for sport-touring use. 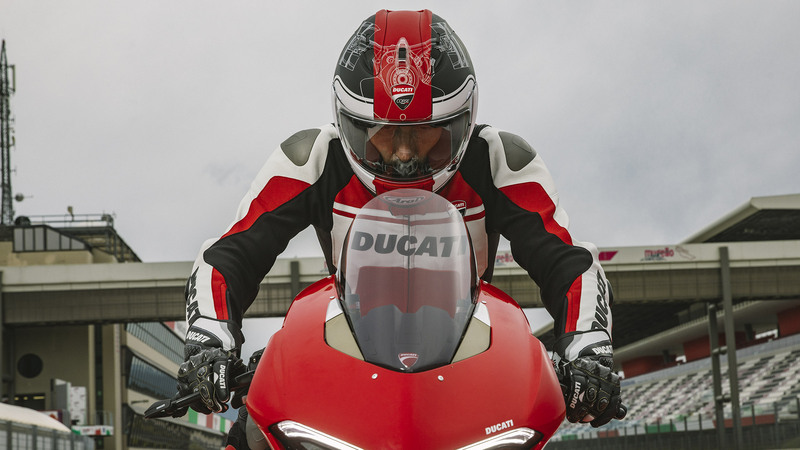 Ducati Horizon HV The Horizon HV is a flip-up helmet and the neon yellow combined with reflex details guaranteeing greater visibility.